OneGram — the very first Shari’ah-compliant digital asset — is coming to represent Islamic finance and as such introduces it to an era of disruptive technologies. The Global Islamic Finance Awards committee has recognized OneGram as the Best Islamic Finance Product/Initiative in 2018. (Sarajevo, September 29, 2018) — Bosnia and Hercegovina’s capital city Sarajevo hosted the 8th annual Global Islamic Finance Awards ceremony attended by the President of Bosnia and Hercegovina, Bakir Izetbegović and the President of Djibouti Ismaïl Omar Guelleh, as well as prominent politicians, bankers, business people, scholars, and academicians that work in or influence this sector. Islamic finance is defined by its compliance with Shari’ah Islamic law. Despite its quite conservative character, the Islamic finance industry experienced a boom in the form of on-going growth – which accelerated especially in the aftermath of the 2008 financial crisis. Islamic assets now total over USD2 trillion, which while only 1 percent of global financial assets are still growing and attracting increasing numbers of advocates in Muslim countries, especially in Malaysia (home of Islamic finance), Saudi Arabia, Qatar, Indonesia, the United Arab Emirates and Turkey. These countries account for approximately 80% of the world’s Islamic financial assets, mainly in the form of Islamic bank assets. The Edbiz Corporation launched the Global Islamic Finance Awards (GIFA) in 2011 and it immediately reached world-wide effect. GIFA aims to recognise “excellence and best practices in Islamic finance” in categories ranging from the banking sector and bank services up to Shari’ah scholars and academicians. Awarded companies, state officials, and subjects are those that promote outstanding achievements or devotion to Shari’ah rules, demonstrate social responsibility and commitment to the Muslim community, or contribute significantly to the sustainability of Islamic finance within the international finance system. Among other awards, the GIFA committee also recognized Dubai-based project OneGram as The Best Islamic Finance Product/Initiative in 2018for its digital innovations implemented into a Shari’ah financial framework. 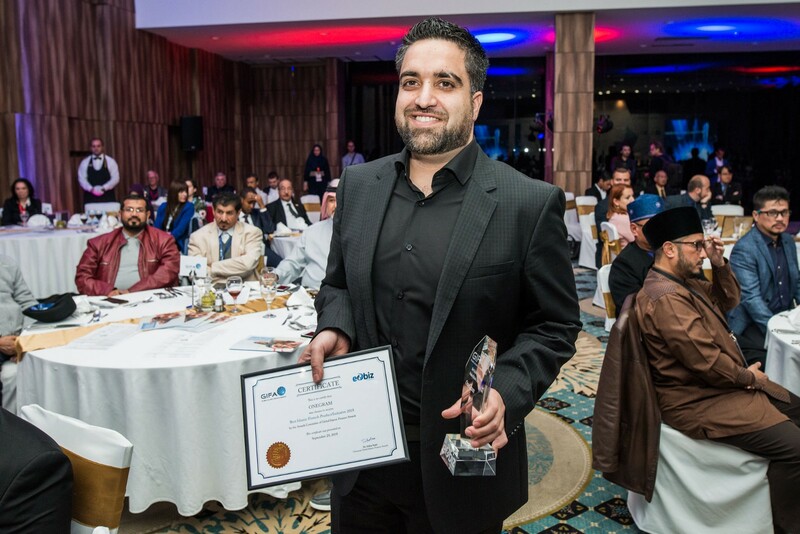 This award represents not only an “honour for the whole OneGram team, but also a significant commitment to maintain the level of technological and business innovations that it brings to the Islamic finance industry,” observed OneGram’s founder, Ibrahim Mohammed Khan. Several features make OneGram “the first” (and only) digital asset ever. The inner drive and architecture make it the first non-reliant bitcoin project based on a peer-to-peer consensus protocol. From the outset it aimed to be a Shari’ah-compliant currency, backed by a tangible asset — gold — which allows OneGram to shift the Islamic financial approach towards the future, whilst keeping pace with the latest revolutionary technologies. And now OneGram is attracting the attention of world news media with global impact such as Reuters and Forbes, as well as investors, scholars, and academics that specialise in Shari’ah rules and their application in the finance sector. So OneGram has become clear proof of the sustainability of Islamic finance in an era of disruptive technologies. OneGram brings many innovations to the market– as a pioneering Islamic project encased into the latest blockchain technology. It paves the way for the broadest user platform, since cryptocurrencies are not impeded by physical boundaries. It uses the latest technology to secure control over own assets, transaction speed is seconds, and cryptography tools facilitate the highest security level. Its value grows continually due to a growing gold backing model, which depends on the number and volume of transactions. Its immutability of transactions prevents any fraudulent operations, and the parameters of social responsibility and charitable principles make OneGram really exceptional on the crypto market. The OneGram project has inevitably inspired other fintech companies to launch copies of very similar projects to the market. Hence as Steve Jobs rightly noted: innovation distinguishes between a leader and followers.